An area of modern Pembrokeshire comprising a discrete block of long, narrow strip fields, now enclosed. A number of authors have attempted to define and to date the field system. Roberts has suggested that it is Anglo-Norman, and indeed many of the fields exhibit the sinuous, aratrally-curved form characteristic of medieval ploughing. However, as noted by other authors, the system is not typically medieval and appears to be overlain by possible medieval settlements such as Manorbier Newton and Jameston. It is more likely to have prehistoric origins, probably bronze age, being co-axial to a prehistoric routeway – ‘The Ridgeway’- along which lie a number of bronze age round barrows. It may be a relic of a more extensive prehistoric field system that has been obscured elsewhere, but is encountered further west in the Castlemartin area. The present sinuous boundaries possibly resulted from medieval re-use of the fields and their subsequent enclosure. During the medieval period, the area lay within the Anglo-Norman manor of Manorbier (and Penally) which was a mesne lordship or honorial barony held, by the service of 5 knights, of the Lordship and Earldom of Pembroke, a heavily Anglicised region that was brought under Anglo-Norman control before 1100, re-organised along English manorial lines and never retaken by the Welsh. The barony had been held, since the very early 12th century, by the de Barris and, on their extinction in 1392, was sold to the Dukes of Exeter before reverting to the crown in 1461. From that point onwards it was leased to a succession of individuals before being settled on the Philippses of Picton Castle, with whom it remained until the 20th century. 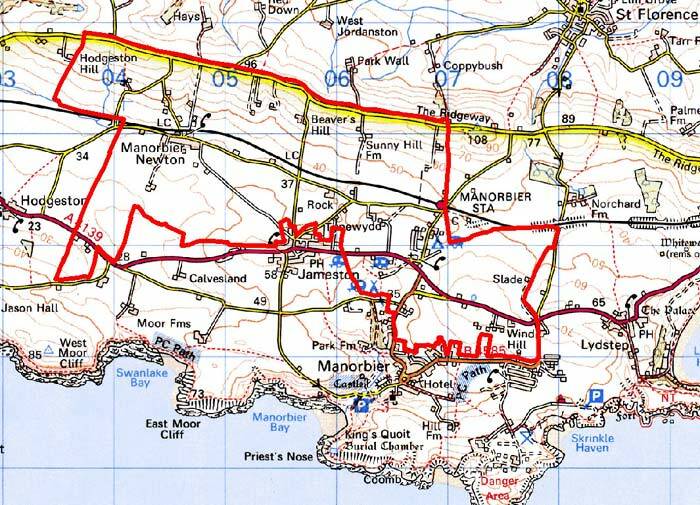 During the medieval period, the strips belonged to the three divisions of the manor, Manorbier and Jameston (see individual character areas), and Manorbier Newton, which represents the only medieval nucleation in this area. 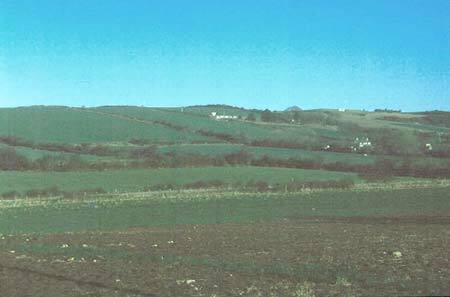 First recorded in 1331, Manorbier Newton was an agricultural vill with a reeve responsible for rent-collection. It was subject to three detailed surveys in 1601, 1609 and 1618 when it was the third largest vill in the manor. Its morphology is that of a small, unplanned nucleation which today may be roughly the same size as it was in the early 17th century. It had 6 substantial farms, 7 houses and one cottage. Corn-production in the village hinterland is confirmed by the surveys, but the loss of 56 acres of arable is recorded between 1609 and 1618. The ‘Lord’s Mead’ east of the village preserved a small area of baronial demesne. Otherwise, tenants held land by freehold, and by two forms of copyhold called ‘husbandry hold’ and ‘censory hold’, which appear to be relics of an earlier, feudal tenure. Only husbandry tenants are recorded on the strip fields; censory lands appear largely to have been former baronial demesne which was not held in common (the censory lands in the East Moor and West Moor character area are however included within Newton in the surveys). Over the three surveys, 16 husbandry tenants are recorded that possessed substantial farmsteads - a total of 8 barns, 9 haggards (corn hay barns) and 6 cowhouses are recorded. It appears from the surveys that the fields were largely still open in the early 17th century but were no longer held in common. By the time of a later 17th century survey the process of enclosure has begun as 19 enclosed field names are recorded. It was more-or-less complete by 1774 when an estate map of New House, Mudmoor and Slade shows unenclosed sub-division surviving within some of the enclosed strips. 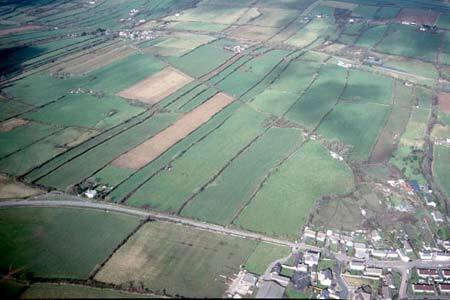 A number of farmsteads were subsequently established within the enclosed field strips. Slade was first recorded in the early 18th century, Sunny Hill in the late 18th century, while Tynewydd is a relatively recent creation. By the tithe survey of 1842 the field pattern and settlement system are virtually that of today, except that there has been some boundary loss. The area is crossed by a railway line, with a station north of Manorbier, which was opened by the Pembroke and Tenby Railway in 1864 and acquired by the GWR in 1896. Long narrow strip fields are the defining characteristic of this historic landscape character area. The long axes of these are aligned north to south. They run across gently undulating ground around Jameston and Manorbier villages at between 30m to 50m up south-facing slopes to the crest of The Ridgeway at over 100m. The Ridgeway forms a definite northern boundary to the strip-fields. On maps it is possible to define groups or blocks of strips, such as those to the northeast of Manorbier and to the southwest of Manorbier Newton, but generally the overall pattern is of a unified, single system. Field boundaries, however, vary greatly across the area, with stone-faced banks and earth banks topped hedges the most common. Even within this type there is variety, with roadside banks often massive, while others are insubstantial. Mortared rubble limestone walls are also present as well as rubble banks/rough dry-stone walls. Both these types are often in a poor state of repair. Hedges on the banks are well maintained. Very few are overgrown or neglected. It is an exposed landscape and therefore hedgerow trees are not common, and woodland is mainly confined to small, scrubby stands in sheltered hollows. Land-use is approximately 80% improved pasture and 20% arable. Farms dispersed along the south-facing slopes below The Ridgeway roughly on the 60m contour are a distinctive element of the settlement pattern. Other farms and dwellings are fairly widely dispersed. Manorbier Newton hamlet is the only nucleation. Local limestone (cement rendered and bare stone) and slate for roofs are the universal building materials in older structures. Farmhouse and farm size vary, and while there are substantial late 18th century dwellings in the Georgian tradition with substantial ranges of stone-built outbuildings located a little distance from the dwellings, most are smaller and date to the mid-to-late 19th century. These are mainly two-storey and double-fronted with examples in both the polite Georgian style and vernacular tradition. Old farm buildings are small, often just one or two ranges, and in some cases attached to the end of the farmhouse, indicating the relative small land-holding size of the former farms. Many of the farms are not now engaged in agriculture – campsites and garden centres are located here - and outbuildings have frequently been converted to non-agricultural use. Some others are neglected and are becoming derelict. Large, modern agricultural buildings are present on working farms. Single storey and two storey houses in the vernacular tradition, small stone outbuildings, a disused 19th century chapel, an old railway station and a handful of modern houses comprise the hamlet of Manorbier Newton. There is a looser cluster of buildings close to Manorbier Station, including the 19th century station buildings, a 19th century school, a 19th century chapel, campsite and garden centre. Three main routes cross this area from east to west: The Ridgeway to the north, the Pembroke and Tenby railway, and the A4139 road, and there are numerous minor lanes and tracks. Apart from The Ridgeway all these routeways seem to cut across, and are therefore later than, the strip field system. Recorded archaeology includes bronze age round barrows alongside The Ridgeway and several prehistoric flint working sites. Limekilns and small pits testify to limestone extraction for use in agriculture and building. The strip fields of this area define it and separate it from the more regular fields of its neighbours.